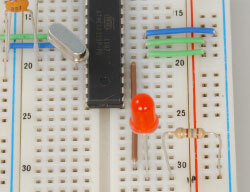 There are many reasons to build your own Arduino circuit on a breadboard or PCB. It takes less space, projects don't always require every pin to be used on the I/O headers, or maybe you won't be using a shield but you still want Arduino as the brain of your project. 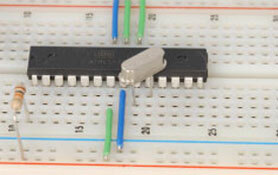 The following steps will outline how to assemble the circuit on a breadboard. I am borrowing the majority of the walk-through from the Arduino site and recommend you purchase Jameco's Barebones Arduino Circuit Kit. You can order the components separately or save a little money by ordering this kit. The breadboard is not included in the kit. Qty. Part Description Mfr. Part No. Start by laying out the pieces in your kit. 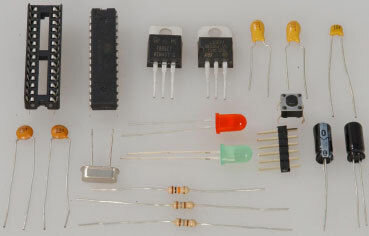 These components are included with the Barebones Arduino Circuit Kit. 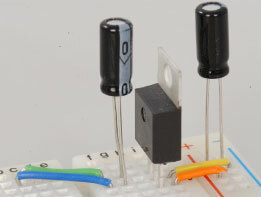 The Arduino power jack can accept an input voltage range of 7 to 16 volts. The most common input sources are a trusty 9V battery or a 9-12VDC power supply. Because most sensors and chips require a 5V source, we will need the 7805T voltage regulator to cut the 9V down to a component friendly 5V. If you connect more than 16V, you risk damaging the IC. A. Add the power and ground jumper wires where the voltage regulator will be as shown below. B. Next, add power and ground wires at the bottom of the breadboard to connect the ground rails and the power rails together as pictured. C. The 7805 voltage regulator is a TO-220 package, so, with the component facing you (printed side) and the leads pointing down the first pin (left side) is where the positive input from the external power source will connect. The middle pin is ground (negative) and the third pin (right side) is the 5V output side. Add wires to connect the output side of the regulator to the power rail of the breadboard and the ground to the ground rail. D. Add the 10µF decoupling capacitors between the input power and ground, and also on the output side between the power rail and the ground rail. The capacitors are polarized; the negative side goes to ground and the other pin goes to the positive voltage. 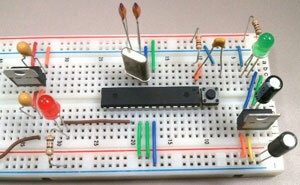 E. Place the power LED close to the input source and at the top of the breadboard. You can use the green or red LED. Connect a jumper wire from the negative lead (short leg) of the LED to the ground rail and install a 180Ω resistor from the positive LED lead (long leg) to the power rail. A. 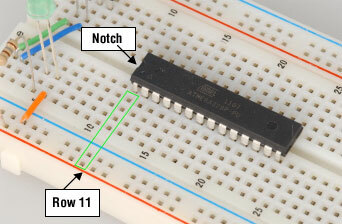 Install the ATmega328 chip (shown on right) so the notched side of the IC is at the top. If you are mounting the components on a PCB, it is a good idea to use the socket. Add the 10KΩ pull-up resistor to the +5V rail and connect the other end to the RESET pin on the ATmega328 (pin 1). Add jumpers for power and ground for the following pins. Pin 20 needs to be connected to power if ADC isn't being used, and if it is, it needs to be connected to power via a low-pass filter (a circuit that lessens noise from the power source). B. 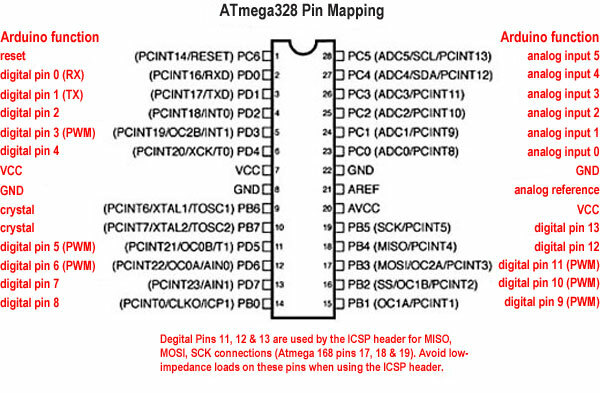 Add the 16MHz external crystal between Pin 9 and Pin 10 of the ATmega328. Then add one 22pF capacitor from Pin 9 to the ground rail, and the other 22pF capacitor from Pin 10 to the ground rail. See below. C. Add the momentary button as a reset switch, so it spans the gap on the breadboard the same way the IC does. 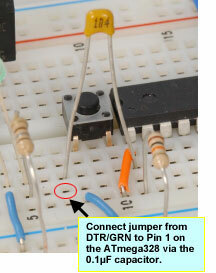 Add a small jumper wire from Pin 1 of the ATmega328 to the bottom leg of the pushbutton (pin closest to the IC). Add another jumper wire from the top left leg of the pushbutton over to ground. D. Add the Arduino Pin 13 LED. 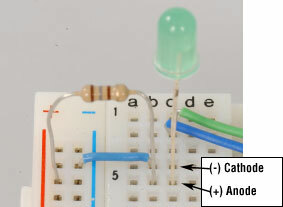 Connect a jumper wire from Pin 19 of the microcontroller to the LED anode (longer lead). 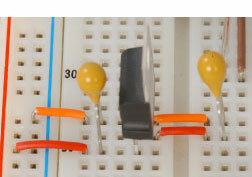 Use the remaining 180Ω resistor to connect the LED cathode (short lead) to the ground rail. Note: Pin 13 on the Arduino is not the same Pin 13 on the ATmega328 IC. 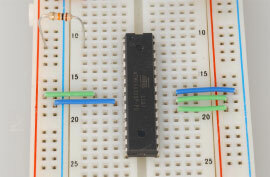 Pin 19 on the IC is actually the pin for Digital Pin 13 on the Arduino. If you are unsure or just want to see the pinout for the ATmega328 IC, refer to the diagram below, or you can view the short form datasheet or the longer version. A. 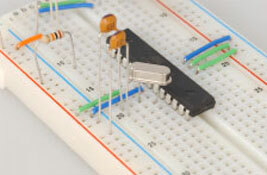 Find some space near the bottom of the breadboard to place the 3.3V regulator (LM1117T-3.3). This is also a TO-220 package but different from the 7805T 5V regulator. With the chip facing you (printed side) and leads pointed down, pin 1 (left leg) is ground, Pin 2 is the 3.3V output voltage side and Pin 3 (right leg) is the input power side. Place one jumper from the ground rail to Pin 1 and another jumper from the 5V power rail to Pin 3 of the voltage regulator. 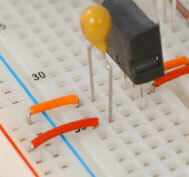 Use a small jumper wire to bring the 3.3V output to its own row on the board. Be sure not to connect the 3.3V and 5V outputs together. B. Install one 10µF tantalum capacitor between the power and ground pins on the input side, and install the other 10uF capacitor between the power and ground of the output side. Note: The tantalum capacitors are polarized, so be sure to install them correctly. The printed face should have a (+) sign on it, but if it doesn't, the longer leg is the positive side. See images below. Correct placement of tantalum capacitors is very important – they are polarized. If your ATmega328 chip is preprogrammed, you should be in business! If not, there are a few more steps necessary to program it. You will need a USB-to-Serial device. 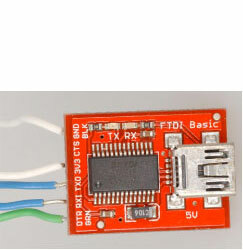 I used the FDTI Basic Breakout Board (5V). If you just want to get it working, you can skip installing the 6-pin header and just run jumper wires straight from the USB-TTL header to the appropriate pins on the breadboard. Be sure the pins are routed correctly for the serial device you choose; the pins on the breakout board are labeled with three-digit names. During my build I discovered the microcontroller needs a perfectly timed press of the reset button to ready the chip to be programmed and the breakout board has a pin called DTR/GRN which sends a signal to the reset pin when hooked up properly. So, connect a jumper wire from (DTR/GRN) on the breakout board to Pin 1 of the ATmega328 via a 0.1µF ceramic capacitor. Ryan Winters is a Product Manager at Jameco Electronics and a Bay Area, California native. He is mostly self-taught and his hobbies include working on cars and computers, fiddling with electronic gadgets and experimenting with robotics.